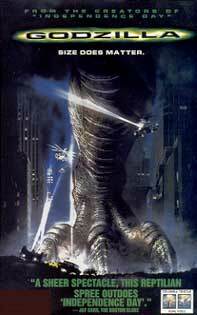 The cheap dude-in-suit Japanese Gojira movies we know gets the big budget American-style Roland (Independence Day) Emmerich make-over with New York being the nuclear-enhanced lizard’s target, as opposed to Tokyo. A scientist studying earth worms at the nuclear affected Chernobyl location is called in when the big monster madness heads for the Big Apple. His ex-girlfriend aspiring to be a news anchor gets her shot to report on this catastrophically sensational event, and they re-connect. Created as a result of nuclear tests, the French are also involved, but all actions seem hopeless in trying to stop the creature. The production design is great and the creature convincingly rendered. The rainy New York setting makes for a great mood. A whole lot of city building demolition, silly humour and loud action makes for an enjoyable ride.